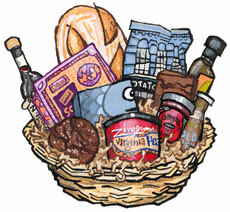 Zingerman's Exclusives Gift Basket for sale. Buy online at Zingerman's Mail Order. Gourmet Gifts. Food Gifts. Many of our best-selling foods can’t be found anywhere other than Zingerman’s. Some of them we make ourselves; others are made just for us by remarkable food makers we partner with from all over the world. This basket includes the best of the best of foods you won’t find anywhere else, including Zingerman's Travel Olive Oil, La Vecchia’s Dispensa’s Balsamic Vinegar, Virginia Diner Peanuts, American Spoon’s Cherry Berry Spoonfruit, Portuguese Sardines from La Gondola, a bag of Zingerman’s potato chips, a bottle of Zingerman’s Cold Brew Coffee, and from Zingerman’s Bakehouse a loaf of Farm Bread, a Magic Brownie, a Ginger Jump Up Molasses Cookie, and a box of Mini Scones.